I went to the Hong Kong Heritage Museum in Sha Tin with a friend, which had exhibits on Cantonese opera, HK’s history, and Bruce Lee. Then we went back to New Town Plaza to do some last minute shopping before I leave HK back to SFO. We stopped at the food court and got a light snack from Yakimasse. We had okonomiyaki and takoyaki. This post will focus on takoyaki, which is also dubbed as “octopus balls”. I first heard about takoyaki when my sister and her friend made them for a high school club fundraising event. I then learned that the process of making takoyaki can be somewhat tedious. First, the batter is poured into a pan with circular molds. Then, a piece of octopus is placed in each circle. (Other ingredients may be added, but most restaurants in the Bay Area may only use octopus.) Then the batter is flipped halfway through cooking, to form its round shape. They’re so fast and efficient at making takoyaki! Each piece had octopus, green onions, and corn. Each piece was also served with a special takoyaki sauce and nori flakes on top. You have to be careful when eating takoyaki- it’s very hot inside! I’ve burned my tongue countless times with takoyaki in the past! Take a small bite first, or wait until it cools down a bit before eating. Takoyaki (たこ焼き or 蛸焼) is a ball-shaped Japanese snack made of a wheat flour-based batter and cooked in a special takoyaki pan. It is typically filled with minced or diced octopus (tako), tempura scraps (tenkasu), pickled ginger, and green onion. 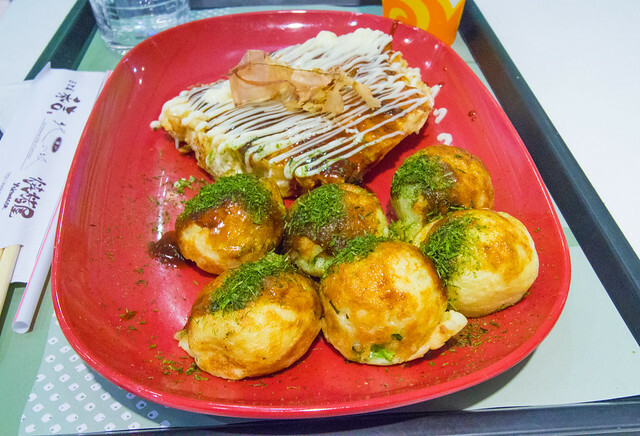 Takoyaki are brushed with takoyaki sauce, similar to Worcestershire sauce, and mayonnaise. The takoyaki is then sprinkled with green laver (aonori) and shavings of dried bonito (katsuobushi). There are many variations to the takoyaki recipe, for example, ponzu (soy sauce with dashi and citrus vinegar), goma-dare (sesame-and-vinegar sauce) or vinegared dashi. Takoyaki was first popularized in Osaka, where a street vendor named Tomekichi Endo is credited with its invention in 1935. Takoyaki was inspired by akashiyaki, a small round dumpling from the city of Akashi in Hyōgo Prefecture made of an egg-rich batter and octopus. Takoyaki was initially popular in the Kansai region, and later spread to the Kantō region and other areas of Japan. Takoyaki is associated with yatai street food stalls, and there are many well-established takoyaki specialty restaurants, particularly in the Kansai region. Yaki is derived from “yaku” (焼く) which is one of the cooking methods in Japanese cuisine, meaning “to fry or grill”, and can be found in the names of other Japanese cuisine items such as teppanyaki, yakitori, teriyaki, “okonomiyaki” and sukiyaki. i had takoyaki when i was in Tokyo and i was disappointed. i think, most likely because i bought some in a small kiosk and not in an actual restaurant!! Need to give them a second try, for sure! That’s a bummer!! Perhaps try them when you visit Osaka, instead. Or Kansai. Since that’s where takyoaki came from!